The housing market has been good to homeowners. In 2017, people who own homes saw record equity growth pushed higher and higher by a mix of rising existing home prices and record low for sale inventory. In essence, the housing market in 2017, was a tale of two opposites — Good for sellers, bad for buyers. With increased prices came lower affordability levels. Still, rising rents are nudging most working adults to at least attempt to buy a house. Demand for entry-level and move-up homes peaked last year. In 2018, that demand will continue despite rising interest rates and changes to the tax code. 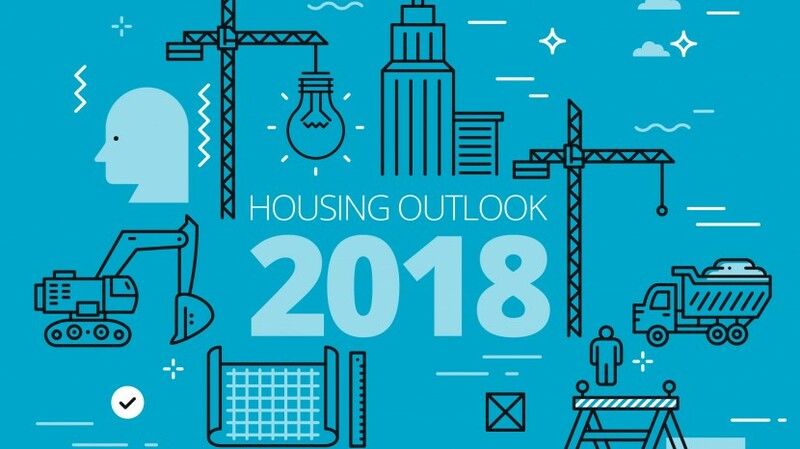 Here are our predictions for the 2018 housing market. More homeowners are staying put; sitting on mounds of equity. To be specific, homeowner equity reached a new high in 2017 at nearly $14 trillion, that’s about $0.5 trillion higher than the 2006 housing peak and more than double the $6 trillion amount during the Great Recession, according to Corelogic. Home equity represents about 20% of a homeowner’s net worth. With restore home values and few homes on the market, many homeowners are sitting pretty and staying put. The Federal Open Market Committee recently released its decision to raise the federal funds rate 1-1/4 to 1-1/2 percent citing the strong economy and low unemployment. What does that mean for housing? Higher mortgage interest rates. In fact, The Fed is expected to raised interest rates three times in 2018 putting pressure on skyrocketing home prices. Yun expects mortgage rates to slowly tick up to around 4.5% by the end of 2018. In November 2017, there was a scant 3.4 month supply of houses for sale, that’s a 15% decrease from the same time in 2016, according to NAR. Dwindling inventory means multiple offers and frustrated buyers. To be sure, the lack of inventory caused prices to skyrocket 48% from the low point in 2011, according to NAR. As more millennials enter the housing market, there are fewer opportunities to convert these renters into owners which means the homeownership rate will continue to languish around 63.7%, the lowest rate in more than 50 years, according to the Department of Commerce. Home builders are promising to construct more housing — this time around in the entry level price range. Since the housing recovery, builders have been sluggish to post new homes for sale. Those they did construct were larger homes relegated to high-end buyers. New tax laws may impact that. The latest trend in new construction housing is smaller floor plans, according to the National Association of Home Builders. Even though builder confidence is at a record high, NAR forecasts single-family housing starts to jump 9.4% to 950,000 this year, well below the 50-year average of 1.2 million new construction home starts. 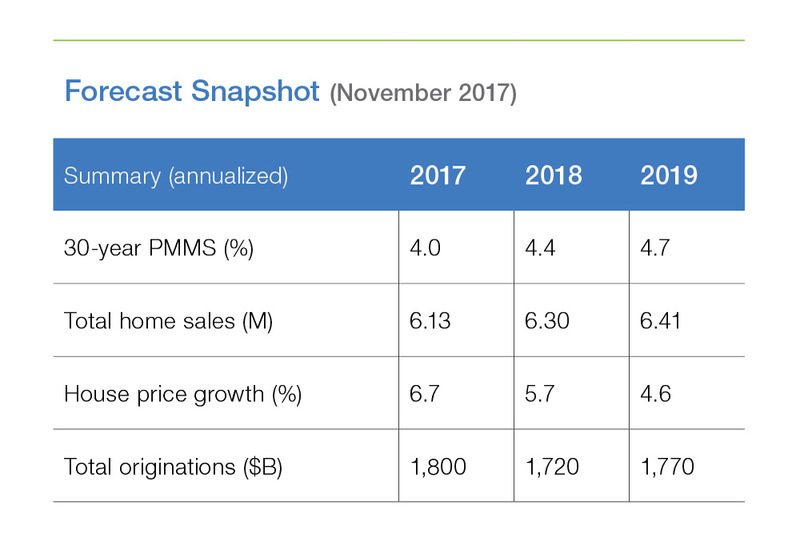 Thus, Yun says new construction home sales will rise to around 700,000 in 2018, up from around 600,000 in 2017. The mortgage interest deduction on primary and second homes has been modified with the new tax plan passed into law before Christmas. Now, only homeowners will mortgages less than $750,000 will be able to deduct mortgage interest. Likewise, property tax deductions will be capped at $10,000. This move especially impacts high cost housing markets like New York and California where the median price of a single family home is about $1 million. Moody Analytics expects these new tax laws to reduce high end home prices by 10%. It also expects national home prices to moderate once the full impact of the tax laws are in place in 2019.